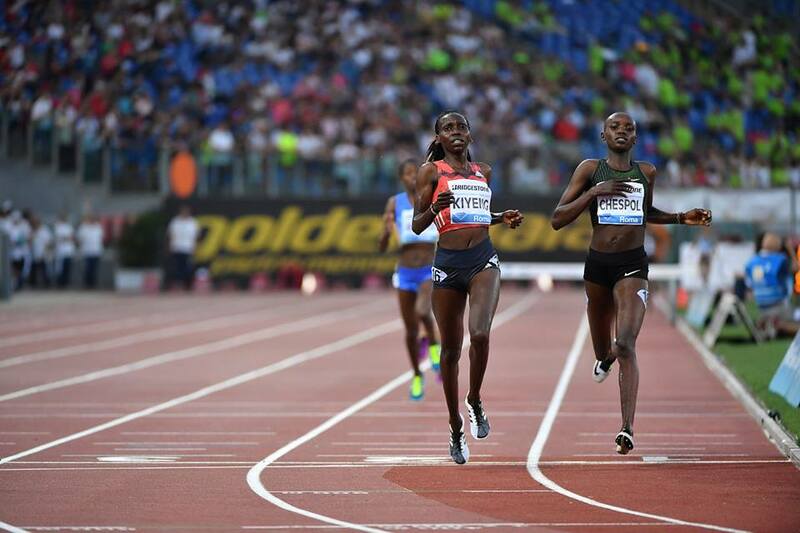 Three Kenyans were among the winners of the 2018 Rome golden gala at the Olympic stadium in Rome on Friday May 31. The meet is part of the Diamond League. Two of the Kenyans recorded world leading times. 2015 world champion, Hyvin Kiyeng, is on her way back to the summit of the women’s 3000m steeplechase. She proved this by winning the race in 9:04.96, a world leading time. 19 year old compatriot Cellphine Chespol was second. It was a dramatic race in which Kiyeng, Chespol and American Emma Coburn were neck and neck at the last water jump. Coburn then slipped and almost fell.In the process she lost her steam and Norah Jeruto also passed her, thus assuring a Kenya 1-2-3 finish. Beatrice Chepkoech who won at the Pre-Fontaine classc was 5th. Surprise Commonwealth games gold medalist, Aisha Praught of Jamaica was 8th. 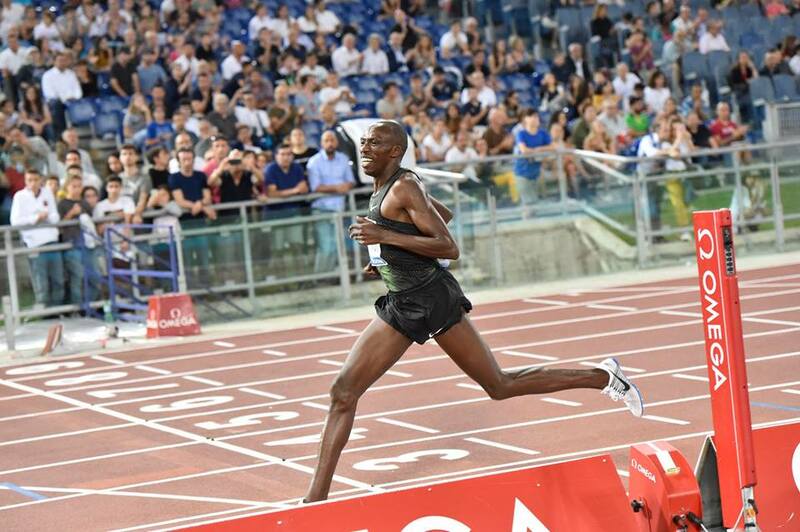 Wycliff Kinyamal, Kenya’s new 800m sensation, won his second ever Diamond League race. It took another late surge to win with Kinyamal taking over the lead from compatriot Jonathan Kitilit with 20 metres to go. Kitilit had a significant lead with 100m to go before Kinyamal started to narrow the lead. In the 1500m, Timothy Cheruiyot appears invincible in 2018. It is largely due to his new tactic of attacking accelerating with 400m to go, to take advantage of his superior endurance. 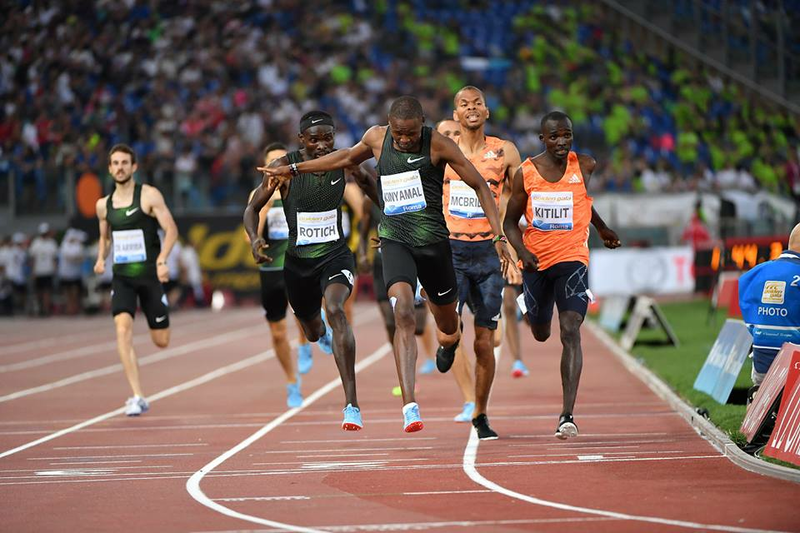 In the past, he tried to win the race in the last 100m, something which played into the hands of Elijah Manangoi who has a superior finishing kick. In this race, Cheruiyot left the rest of the field for dead with 400m to go. Manangoi finished second ahead of Ethiopian Samuel Tefera who was 3rd. Ayanleh Souleiman who has been a major challenger in past years, appears far from his best this season. He finished a distant 4th. This entry was posted in Kenya Athletics News, Kenya Sports news and commentary and tagged hyvin kiyeng, Jonathan Kitilit, Timothy Cheruiyot, Wycliff Kinyamal. Bookmark the permalink.